.....don't happen that often around here, so getting to paint them is a real event. This is from an 8x10 study I did about a year ago. 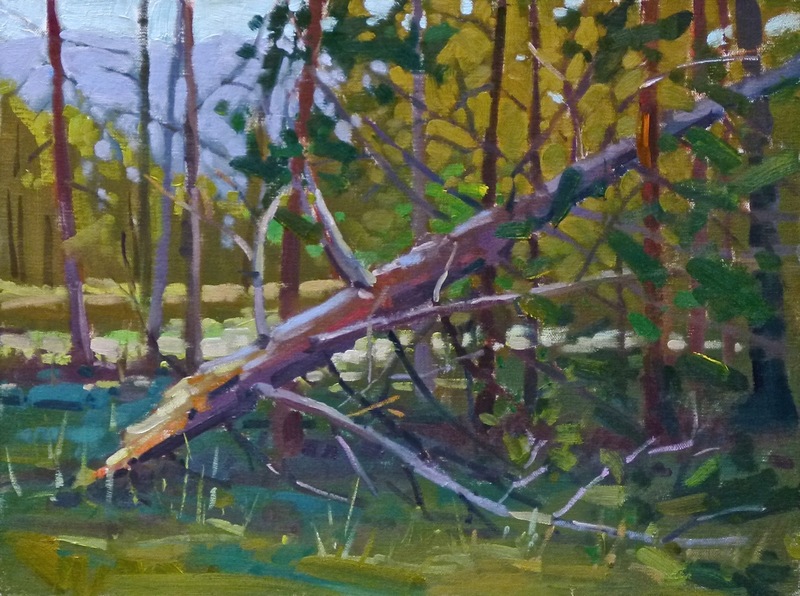 I liked that small painting but always thought there was a bit more I could do with it. Some altering of the color space, some moving around of details and changing the size of some of the shapes and this is what I got. I wanted to show off the majesty of those ephemeral clouds against the line of those boats....just little dots of color. 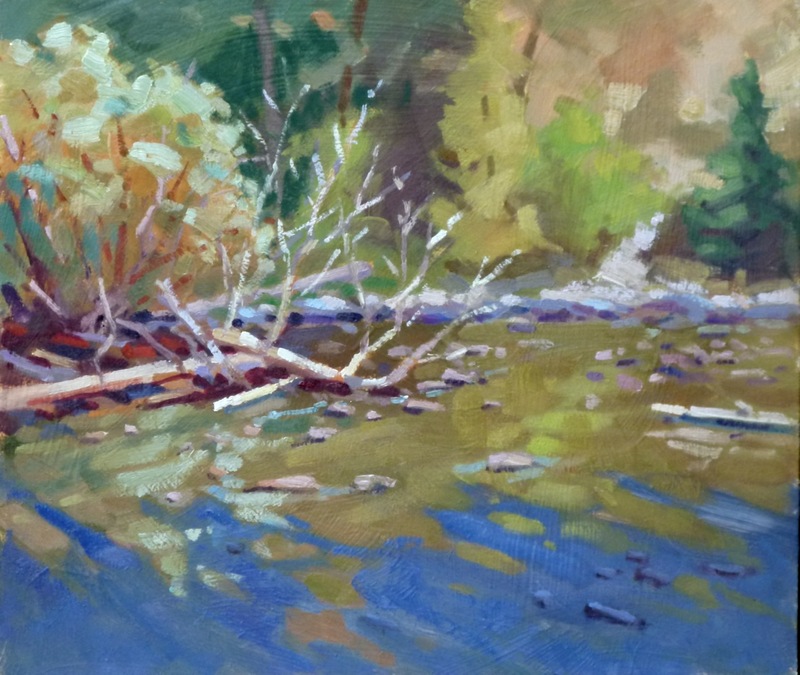 It will be at the Roby King Gallery. .....painting on the Swan River in Bigfork, Montana. It was a nice way to spend the day. This one needed some tweaking when I got it home as I hadn't gotten the darks quite the value but I think it reads OK now. I still ponder what happens when we get in creative slumps. I know two things: 1) keep painting (or whatever it is you do) and work through it, and 2) something better will happen eventually. Don't stop. ....this tree about six feet from our Montana cabin. It was a nice tree; now it is half a nice tree....but it landed in the woods rather than on the roof so 'OK'. 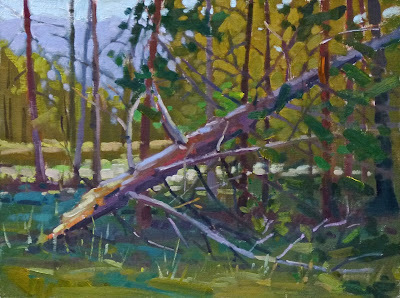 If course I couldn't stare at it for two weeks without beginning to be intrigued by the painting possibilities so, putting up with the yellow jackets (who seem to like oil paint), I had a good time with this one morning before the temperature rose and the light changed. I also did a larger one but it needs some touching up before calling it finished. Change of topic: I heard a man being interviewed the other day who was talking about how our western educational system can ignore or squash a student's natural talents. As an example, he mentioned how Paul McCartney and George Harrison had the same music teacher in school when they were teens. According to that instructor, and the grades they received, they had little or no recognized musical ability. Imagine. My Sweet Lord! Since I seem to be in an artistic slump and thinking I've 'lost it...if I ever had it', I'm going to take some comfort in his example. No, it doesn't exactly apply but who cares. It still makes me feel better. I never did figure out which color the yellow jackets liked best...but it surprisingly didn't seem to be yellow. Go figure. .....and I was too tired with a summer cold to do much painting. So I drew. 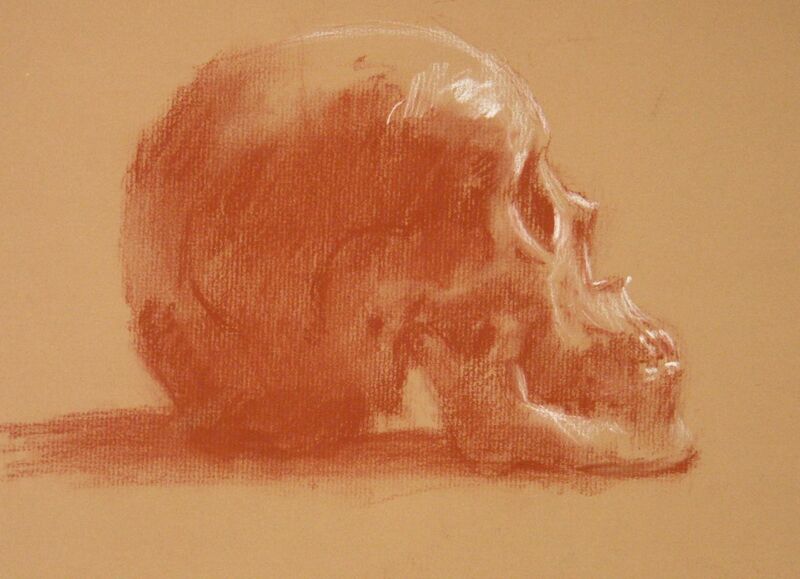 Always a good idea.....but that's not what this blog entry is all about, other than to say that the only 'line' I used is the faint one establishing the center of the skull down to the ear hole. You can faintly see it. After that it was just tone after tone, shape after shape. 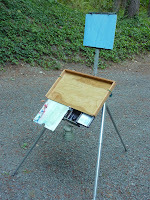 The reason to write today is to show you how I remodeled my Soltek easel. I really like the Soltek and bought one when they first came out when I was visiting the studio of Jim Wilcox, the maker and designer. My only complaint is that I'm an 'arm-swinging' painter. The palette in the Soltek goes front to back while my arm goes side to side. Plus, I never seemed to have enough room on the palette. I tried several solutions but they were all just patches that didn't work that well. I considered the Palm Palette which is a terrific solution but after thinking through how I paint I wasn't sure it would work for me either. 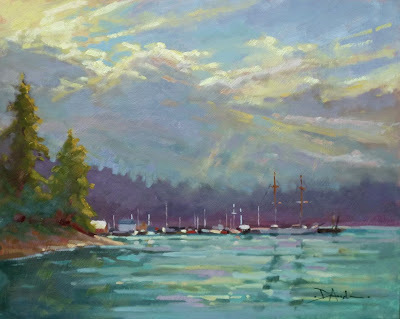 I wanted access to the storage areas, a backing edge to push the paint against, the ability to have the palette on a similar plane to the painting.... but needed it to be compact. Here is my solution. It is similar to what Colin Page straps across his Artwork Essentials easel. I had already had this idea before I saw what Colin did so was encouraged to try it. 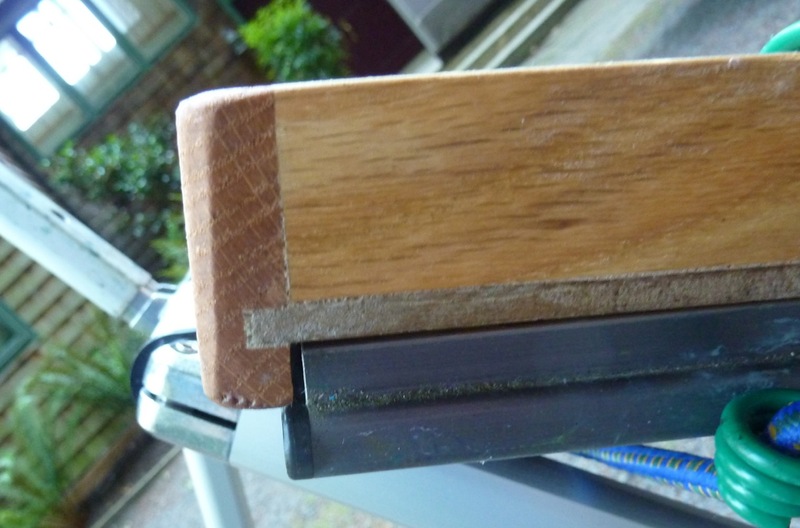 It is a simple piece of birch plywood with oak edges on three sides that has been given several coats of linseed oil mixed with Gamsol to seal it. I used Gorilla Glue to put it together....it will never come apart. The palette is the same size as the folded up Soltek....see below for how they strap together. The top edge is wider than the others so it can catch on the upper edge of the easel, keeping it from sliding down when I tilt the storage box. 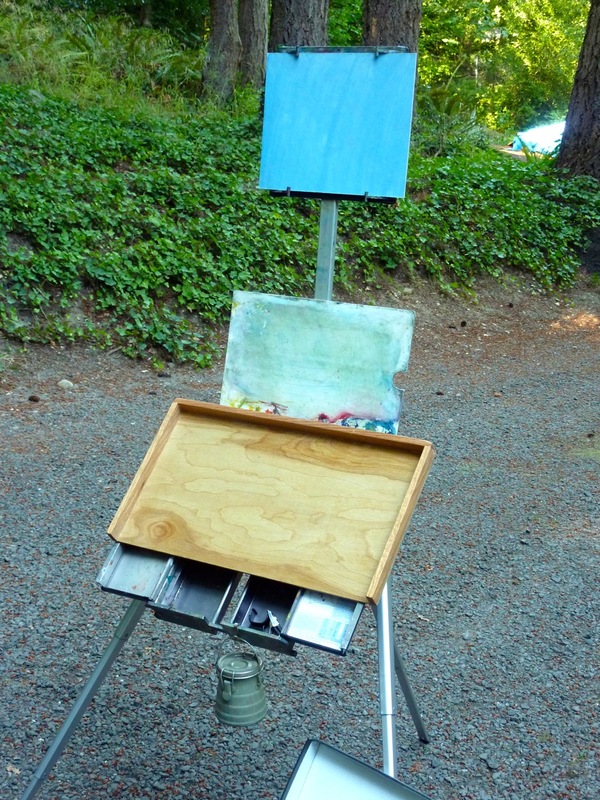 I hold the palette in place with a bungee cord. By not making the palette deeper I can have access to the storage areas and trays to store brushes and palette knife. The palette that comes with the Soltek can be used as an extra mixing area by just slipping it under my palette and securing it with a small spring loaded clip. The solvent hangs off the front edge from an 'S' shaped hook, swinging on its handle. 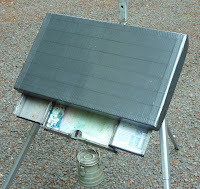 The Soltek palette can also be positioned leaning against the center pole, although I'll probably not use it this way. 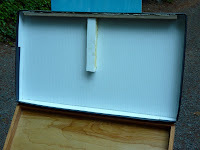 The cover needed to be light weight so I used the corrugated plastic that's used for signs....about $5 at Home Depot. I bent the edges by rolling a pizza cutter along the line to be bent plus encouraging it to soften and bend by heating it with a hair dryer. Duct tape, what else, finished it off and holds it together. 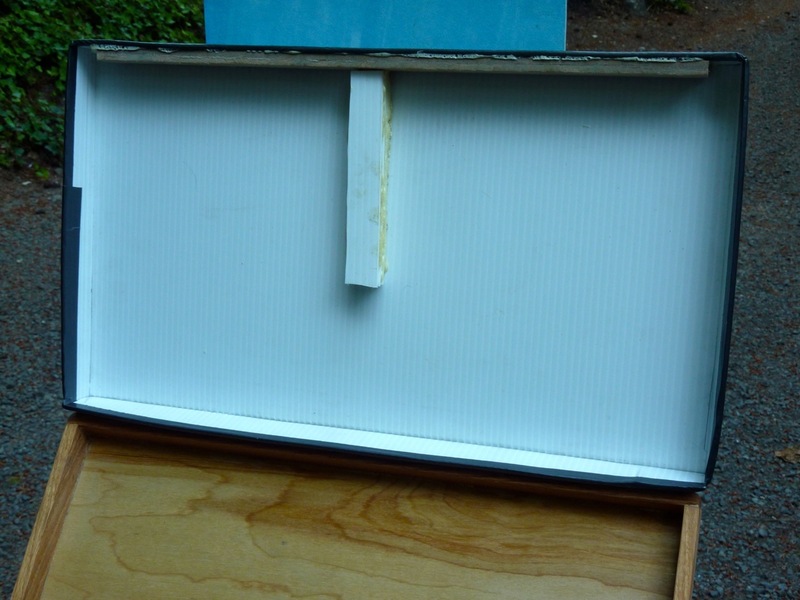 On the inside I glued a strip of wood along the front for support as well as added piled up left over plastic that I glued together. 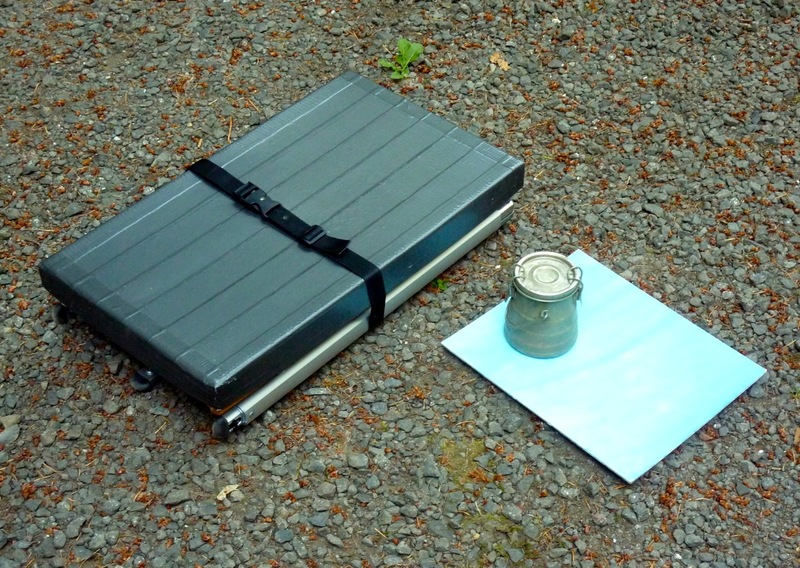 Both of those things keep the lid from compressing on the paint during transport. The three oak edges support the other sides. You certainly don't have to use oak but I do recommend a closed grain wood like birch for the palette. 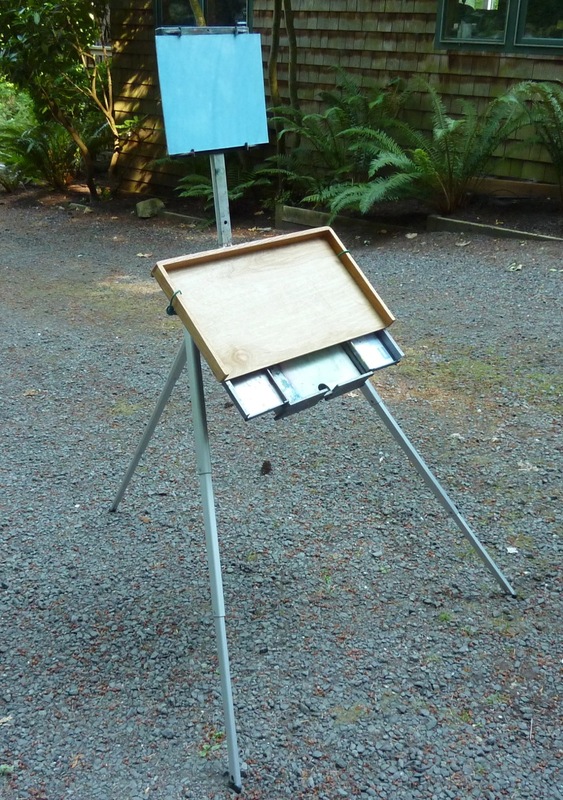 Because the palette is the same size as the folded up easel I can just strap the two together and be off. 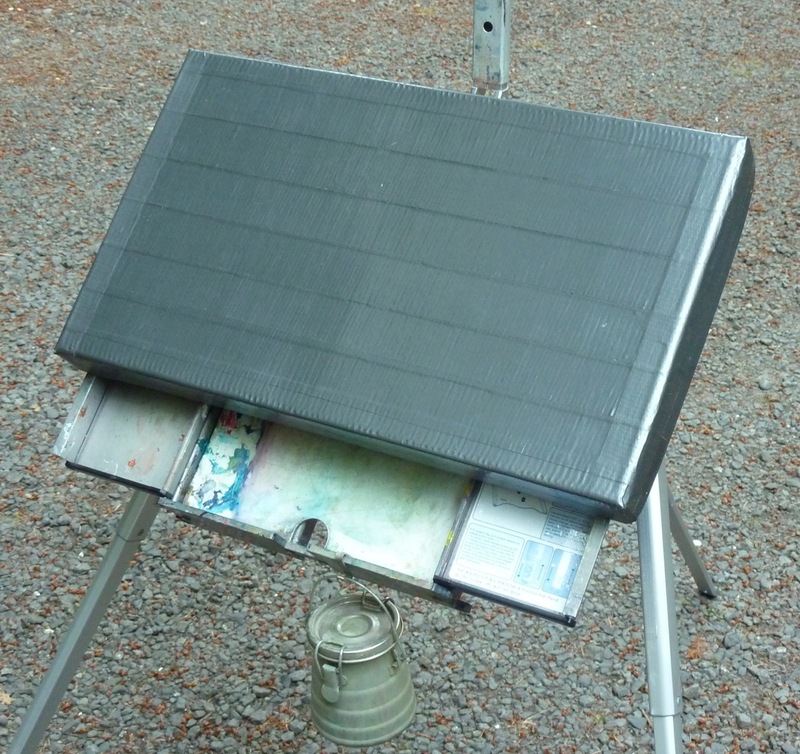 The Soltek holds the paint and brushes. Lightweight, cheap and easy to build, compact....but lots of mixing room. By the way, earlier this summer I sent in the Soltek to have the longer legs put on. They refurbished the beast and added the new and improved legs....well worth it. There you go. I have to go paint.